Droughts are not uncommon in our farming systems. After the 2002, 2006, 2007 and 2008 droughts there have been publications to assist growers with their decisions coming into the following seasons. While there are many issues including herbicide carryover, weed burdens, subsoil moisture, crop diseases and managing cash flow, the most common question is about the opportunity to adjust fertilizer inputs especially P.
1. Grain removal is likely to be low because of the poor yields. If the crop was salvaged for hay - P was removed. Cereal hay removes around 1kg P/ha/t, while grain removes around 2.5 kg P/ha/t. Canola hay removes around 3 kg P/ha/t. In any case, knowing the P removal is important - grain P can vary from 1.8 to 4.5 kg/t - so getting grain tested will give a guide to the actual P removed. 2. Soil P tests are the starting point for any decision, but they are not likely to reflect that crop failure from the previous year, and if soil testing has been regularly done on the paddocks, expenditure on further testing may not be necessary. If not, then soil tests are needed. 3. If the soil P test is above the critical soil test value, P rates can be reduced although some P at seeding is likely to be beneficial. 4. If the soil P test is below the criticial soil test value, lower P rates can be used but yield may be affected. 5. P applied at seeding near or below the seed is the most efficient method of application, although if using MAP/DAP take care with wide rows, on susceptible soils and with sensitive crops. 6. On neutral to acid soils, much of the P applied is still likely to be available, so reduced rates are feasible. 7. On calcareous soils, P fixation can still occur even under dry conditions, so using fluid P in furrow may be a good option. 8. Where crops completely failed and the soil is in the maintenance phase, P rates can be reduced significantly. 9. There is nearly always a benefit to having some P in the seed row, and rates of 3-5 kg P/ha should be considered as the bottom line. Lower rates are likely to be less evenly distributed so give poor results. 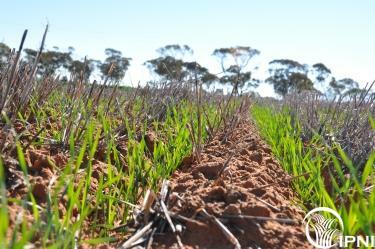 If the phosphorus history of the paddock is very good, then it is possible to skip P application after a failed (drought affected) crop but if only maintenance applications are used, the crop would benefit from some P at sowing.